From the first paragraph of this book, I was hooked. 1979: This was the year the parents in my neighbourhood began killing themselves. I was eleven years old and in Grade 6. Elsewhere in the world, big things were happening. McDonald’s introduced the Happy Meal, Ayatollah Khomeini returned to Iran and Michael Jackson released his album “Off the Wall”. But none of that was as significant to me as the suicides. The story is told, through multiple perspectives of an eclectic mix of neighbours that make up a small section of the Scarborough suburbs. My parents loved the neat grid of black road, the bright white stripes to differentiate the lanes, the chain-linked fences that divided our properties but gave us views into the neighbours’ yards, the young, weeping trees lining our streets. They said you couldn’t get “all this” in Hong Kong, where everybody was crammed on top of each other in tiny apartments, and they would sweep their arms to include whatever “all this” referred to, like showcase girls on “The Price is Right”. If you’re a person who likes to imagine what’s going on in the houses you drive by (like when people forget to close their curtains at night so you can see what they’re watching on TV, or have a peek at the colour of their wall paint), then this is a book for you. The neighbours’ lives in this book intertwine through the chapters and the years. Some know each other better than others, but all are connected. Young and old alike are shocked by the string of suicides, but it’s the young who pay closest attention and are at greatest risk of being affected (by what they don’t see or hear as much as by what they do). Like the Hardy Boys and Nancy Drew, we started watching our parents carefully, taking note of unusual things. There’s Mrs. Da Silva, who came here from Portugal with her husband over 20 years ago, and is still amazed by how easy it is to hook up a hose to the side of the hose and have water come out when you turn it on. Other things are not so easy… how was she to know how cruel her husband would turn out to be? Francesca has moved into the neighbourhood from Little Italy with her new husband Nick. She has everything she could have asked for, except a baby. She feels at loose ends around the house during the day and starts questioning her devotion to her husband. Darren’s mother, who is from Jamaica, wants him to work hard at school. He does his best, but Darren would rather draw. When they get a new teacher things are looking up until he realizes he seems to be singled out as troublesome, even when he hasn’t done anything wrong. June and Josie, both Chinese-Canadians, have always been best friends. But when June falls in love for the first time and Josie comes up against something she feels she can’t even tell her best friend about, their friendship changes into something more fragile. The recent string of suicides is not something the neighbours want to talk about. But when Rainey moves in with her mother, she becomes fascinated by them. Maybe she’s hoping to find clues to help her understand her own suicide attempts. She is very aware of the secret nature of her “illness”. If she could go through the motions of living, she hoped it would be enough. Some days, it was. Some days, she wished the glass walls around her would smash into pieces, and she could step away from the splinters and feel whole again. It had been so long since she had felt anything that the years prior felt like someone else’s memories. In all of these stories, the time and place are well cemented with abundant references to news, TV shows, music, movies, clothes, makeup, hair styles, and attitudes that will take you right back to the era. (Even if you weren’t born yet!) Mentions of Barry Manilow (Copacabana! ), The Love Boat, Charlie’s Angels, The Carol Burnett Show, and McDonald’s milkshakes had me wishing I could go back in time for a little while. Does anyone ever get McDonald’s milkshakes anymore? And do school children still feel jealous of the kids who have the big set of crayons or coloured pencils with the full range of colours? He considered his No. 12 Black to draw them, but he wasn’t black. Neither was his mother. They were both No. 10 Photo Brown. He was a bit Chestnut Brown too, but his mother was also No. 26 Burnt Sienna, a colour that even Nav didn’t have. Only the luckiest kids could afford the thirty-six-pack Laurentians. Overall, a satisfying, nostalgic, absorbing read. You never know what goes on behind closed doors. Or inside people’s heads. I looked down at the dark street and knew now that there were things that lurked on the other side of doors, behind the friendly faces, underneath the polite chatter across the fences. 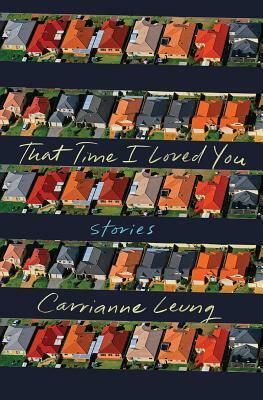 That Time I Loved You is a finalist for the 2018 Toronto Book Awards. This one sounds really fascinating, Naomi, I love small town life and what we see beneath the surface. It was, in many ways, part of what FORCE OF NATURE, by Jane Harper, is all about. That minutia that turns out not to be that small after all. I’m so glad I could tempt you with this, Alex! Oh, indeed! Given I’m so hard to please. Ha! Ha! You’ve sold me! Now on my TRBTEOTY (to read before the end of the year) list. Hooray! I hope you enjoy it as much as I did! I think I’d love this! One question, though: The second cover says “Stories”. Is this a book of inter-related short stories or a novel? Looks like linked short stories or a “novel in stories” — these are often marketed as either stories or a novel depending on the country. I’d love to know the decisions that go into the labelling. A novel made up of stories that are heavily inter-connected. The characters in them continue to show up in other chapters as well as their own. I just passed by this book on NetGalley today — I’m going straight back to request it! (Not out in the USA until Feb. 2019, so I’m not sure how early it will be made available online.) I am definitely one of those people who walks by lighted windows in the evenings wondering about the people who live inside; the first story in Lauren Groff’s Florida is from that very perspective. I can never resist a linked short story collection. Interesting that it hasn’t been marketed that way for the Canadian edition. I can see why they might not have known quite how to market it. Each chapter is an individual story, but the characters move in and out of each other’s chapters so much that it feels like a novel. I’m so glad you’re going back to request it! This sounds right up my alley. Great review, Naomi. Thanks, Susan! I’m getting the feeling that most of us love this kind of book! I really enjoyed this blog post – not only does the novel itself sound like something I’d enjoy, but I love how you included small excerpts and some extra reading material at the end! Oh this really appeals to me – the premise, the setting, the quotes. I have to read this! Yes! I remember not only loving those milkshakes, but desperately craving the Shamrock Shakes which were available in the spring (like Cadbury’s Eggs, which used to be the same, but now they are available all the time and of course now we know about chocolate and slave labour which I certainly didn’t know about back then, so that doesn’t matter after all). And I loved how she mentioned Captain Stubing’s dinners in particular: I’d forgotten about them but immediately it all came back. (On Friday nights where I lived, “Fantasy Island” came on after “The Love Boat” and I loved that show too). 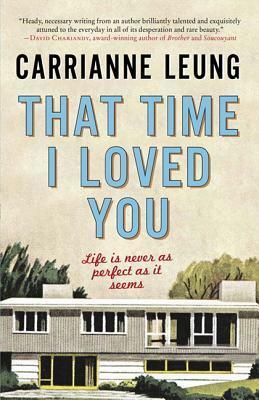 Carianne Leung does the same thing with small cultural details in The Wondrous Woo: I think you might like that one even more (although I know you’re especially fond of linked stories, so maybe not). I feel like she gets the balance so right between details and universals! I am so anxious now to read The Wondrous Woo! But I’m thinking it will have to wait until after the totally crazy busy Fall. I like to imagine the bunch of you waiting to sneak TV shows. I watched them *with* my mom, which probably says a lot about my upbringing right there. If it helps, it was a very quick – almost single sitting – read for me. But I would “keep”: it until you are in the mood for another book like this one – there aren’t a lot that manage to straddle that balance between serious and not-overwhelmingly-serious so deftly. Our favourite show to “sneak” was Three’s Company. We loved it! It sounds like an interesting premise. So do I! When I’m back-to-school shopping for my kids, I still look longingly at those bog boxes of crayons and coloured pencils. And markers, too. Our parents never bought us markers. We were so deprived. Haha! This sounds like something I would enjoy – I’ll keep my eyes open for it when it comes out in America! My husband definitely likes the McDonald’s milkshakes, and we were definitely jealous of the kid with the 96-count box of crayons in the 90s (it, at least I was because it said something about money and bring cheap and/or broke). My friend always had the big box of crayons with the crayon sharpener in the back. Happily for me, she always shared! I grew up with scrappy kids on a poor reservation. There was no sharing. Blech. Okay so this is a novel right? Somehow I thought it sounded like a memoir. That first paragraph is a doozy. How many suicides are we talking? She’s seems a good writer. Yes, it’s a novel. The suicides are fictional, and there are a reasonable number of them – enough to cause a stir but not so many as to be unrealistic. If you decide to read it, I hope you enjoy it! This sounds so good Naomi – thanks for putting it on my radar! I really like the quotes you pulled and the interlinking stories style sounds like it would work really well in capturing a neighbourhood.